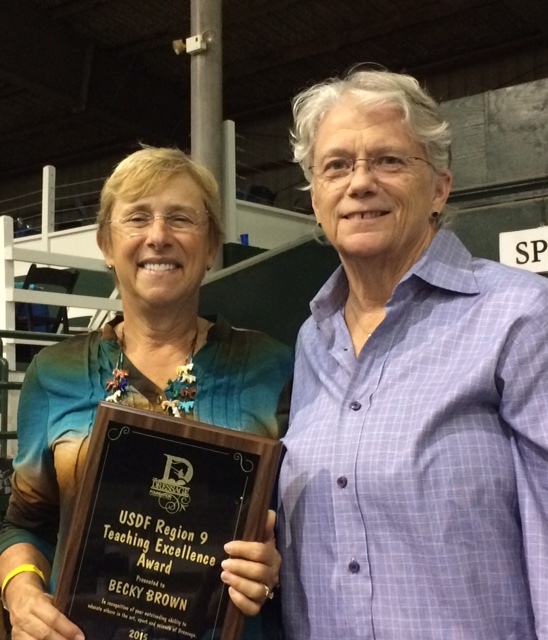 Becky Brown of Dallas, TX, received the seventh annual “USDF Region 9 Teaching Excellence Award” at the Great American/USDF Region 9 Championships held in Katy, TX, October 8-10, 2015. She received a $5,000 award for demonstrating adherence to sound dressage principles and the ability to communicate these principles so that students develop themselves and their horses in a logical, progressive and humane way up through the levels. Becky Brown is a USDF Certified Instructor through First Level and is also certified through the USEA Instructor’s Certification Program. The Becky Brown School of Horsemanship was established in 1990, and Becky has helped students earn bronze and silver medals. She is currently the chairperson for the USEA Youth Membership Development Committee and is active in the Dallas Dressage Club. "What a thrill to be awarded the USDF Region 9 Excellence in Teaching Award for 2015! My life’s passion has been to study hard to become an instructor to the best of my ability. I earned my certification in all three major disciplines in the United States (USDF, USEA, and USHJA) as well as The British Horse Society. Students come from all backgrounds; I wanted to be effective with each one in teaching them to ride and train their horses in a manner that develops obedience, flexibility, and balance," Becky says. "The USEF definition of dressage includes the words “happy athlete.” I believe that applies to the rider and the horse; if I can improve the confidence of riders and their communication and empathy with their horses, that improves the quality of horses' lives as well. If I do that, then I feel I have added to the world."